A bunch of months ago, the association of entrepreneurs in Padova (Confindustria) and the University of Padova asked me an interview in which I talk about my experience as a PhD that is working in the IT field. I immediately said “yes” because the interview was supposed to be inserted in a university course taken by 117 PhD candidates and also because the Professor that was coordinating the project is a person whom I respect: Prof. Paolo Gubitta. I collected all my thoughts regarding how many things I learned during the PhD that became very useful once I started to work as a software developer and entrepreneur in the IT sector. Here is my interview, in Italian. 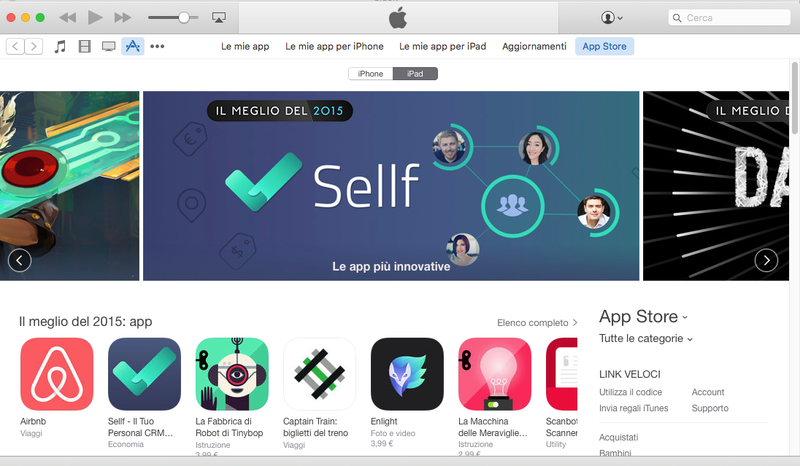 Sellf has been chosen by Apple as #‎app of the year: what a great way to end 2015! I’m very grateful to my team and to our users for being such an awesome part of this!